Today is World Book Day (if you haven't noticed! ), and like every year, it creeps up on me and it’s only at the very last minute, usually at 10pm the previous night, that I realise: “What the hell is Becky going to wear?”. Ever since her first year at nursery - when I first fell into the trap and left it too late to organise anything, and Becky ended up with just a knitted woolly hat featuring bear ears and clasping a teddy in her hand (Soz Bex!) - we are clutching at straws for World Book Day. Unfortunately, I’m one of those totally useless, uncrafty Mums, who can’t even sew a button on properly, so there is no chance of me fashioning anything for her myself - something original, some actual, proper book character. I wish I could just whip out my sewing machine, do a quick brain storm with Becky, and then, voila, a day or so later, we’d have some homemade super costume. But no chance – I’m neither arty or crafty, nor do I have the time (and let's be honest here, nor the inclination) to do so. So, every year, we end up rummaging through our fancy dress box or make a last minute dash to the supermarkets / Amazon / eBay / t-interweb to get our hands on some costume. This year we opted for the former, and, having raided her dressing up box, Becky decided she wanted to go as Princess Sofia The First. 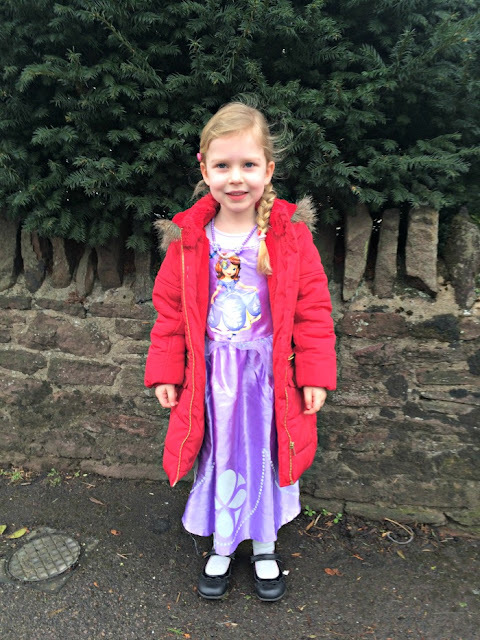 So here we are, Becky on the school run this morning as Sofia The First.